If you care about soccer at all, you were definitely glued to your TV today, watching to see if a certain team could do the impossible by overturning a huge first-leg deficit. And while one team did do just that by pulling off an enormous comeback, it was almost certainly not the team you expected. Roma-Barcelona was the game everyone hoped Manchester City-Liverpool would be. While City were busy quite admirably though ineffectively huffing and puffing and trying to blow Liverpool’s house down, Roma actually were tearing down Barcelona’s walls brick by brick. Barça came into the match with a 4-1 lead from the first leg, and because Barça are a much better team than Roma, the prospect of a Roma comeback didn’t even rate in comparison to City’s upset bid. Which really shouldn’t have been the case, because Roma’s chances were always much stronger than City’s. Because I was one of the millions of soccer fans completely absorbed by the City-Liverpool game, I could barely find a spare second to tear my eyes away from the match in Manchester on TV and glance down at my laptop to catch a glimpse of the match in Rome. Suffice to say, I don’t have much insight into how exactly Roma’s shocking 3-0 win came about. What I did manage to glean from the bits I saw and the commentary and the stats was that Roma were far and away the better team today. The Italian team took 17 shots to Barça’s nine, including 12 inside the penalty box, and generally blew through a curiously lethargic Barça defense at will. On paper the upset looks huge, and it is, but that shouldn’t overshadow the fact that this Barça team was eminently beatable, even if they are the better team as a whole. Though Barcelona are in the process of coasting to the Spanish league title, they’ve done so almost exclusively because of the greatness of Lionel Messi. The team and the tactics surrounding Messi have been notably pedestrian all year round. You can get away with playing it safe in La Liga, when the GOAT’s superiority is so constant that over 38 matches it’s almost impossible to keep up with him. But in a two-leg knockout tie, where the ability to control matches through the midfield—ironically Barcelona’s biggest weakness for years now after being the team’s biggest strength during their world-conquering golden era of not that long ago—becomes more important, relying on Messi alone to bail you out is incredibly risky. But hey, the props belong to Roma here. In contrast to Barcelona, Roma’s squad construction is such that they’re better built for knockout competitions than for league play. This is demonstrated in their relatively mediocre Serie A performance (where they currently sit in third place in the table, well off the title chase and only a point above Inter in the Europa League spot) and their surprising but well-earned Champions League semifinal appearance. Their midfield is hard as nails with muscly figures like Daniele De Rossi, Radja Nainggolan, and Kevin Strootman. Up top they’ve got a big and strong and goal-hungry striker, Edin Džeko, and flanking him they have an assortment of quick attackers who can break into space and create danger in tight spaces. 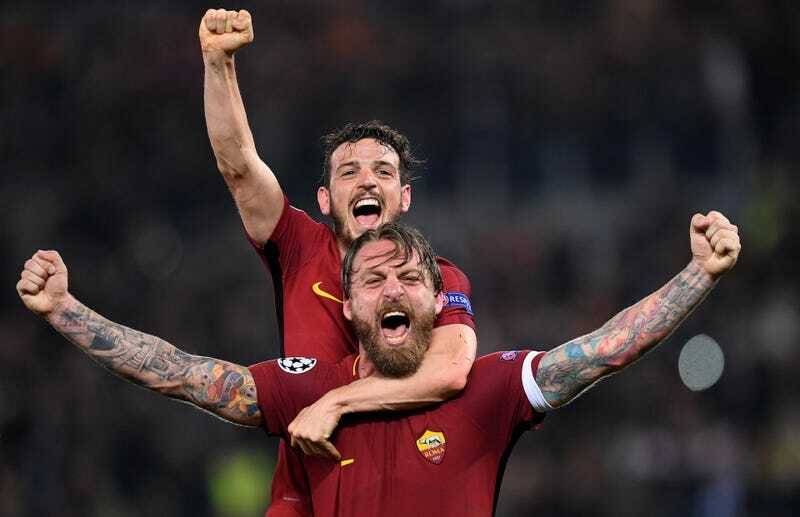 With those guys, and a trio of burly center backs who won’t be bullied by anyone, Roma are perfectly primed to win the kinds of tight, ugly, counterattack-heavy matches that often make up UCL knockout rounds. Sure enough, they used that strength and pace to do just enough to topple Barcelona, and onto the semis they go. Regardless of Barça’s relative weaknesses and Roma’s strengths, this is still a colossal upset. Even though it would’ve been hard to imagine them going all the way unless Messi went truly wild, Barcelona should still be humiliated by this. On the other side, Roma and their fans have to be absolutely ecstatic. Sure, every other team in the semis will be desperate to draw the Romans in the next round, but with the power that exists in this squad, the confidence they’ve just earned with the big Barcelona win, and the fact that no one expected them to get this far, Roma have no reason to fear anything or anyone.